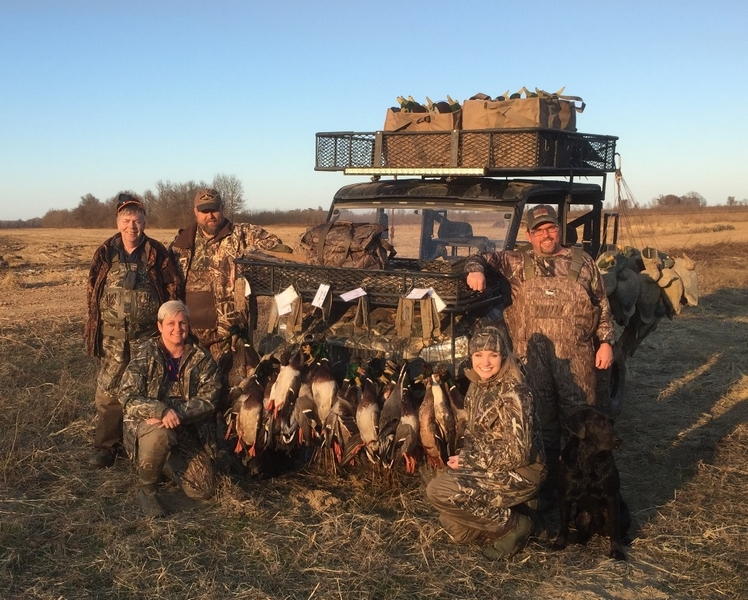 Stan Jones has been guiding duck hunters for over thirty years in Arkansas, treating them to some of the best duck hunting in the world. About five years ago, Stan opened up his new “Stan Jones Mallard Lodge” that has met with international acclaim. The Stan Jones Mallard Lodge is a little over two hours from Little Rock, located right past “resume speed” in the Alicia, Arkansas area. 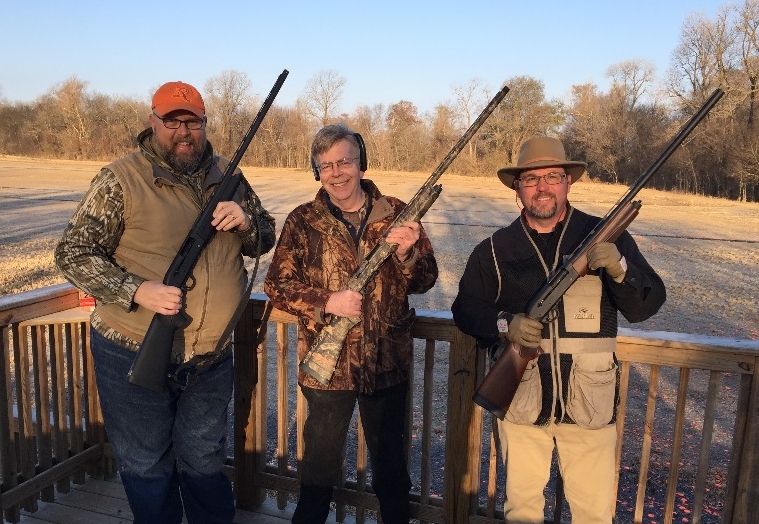 L-R: Ron, Randy, and Vince after some early morning sporting clays. 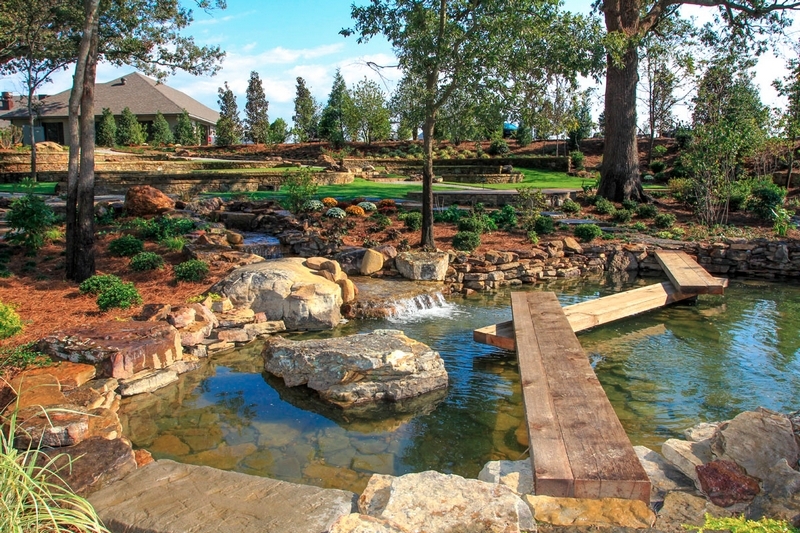 Stan's Lodge is manicured: a beautiful spot that is popular with hunters, for corporate events, and weddings. It has all the amenities that anyone could ask for, with an outstanding staff. Chef Jay Taggart gives everyone exceptional fine dining to go along with the fine hunting. 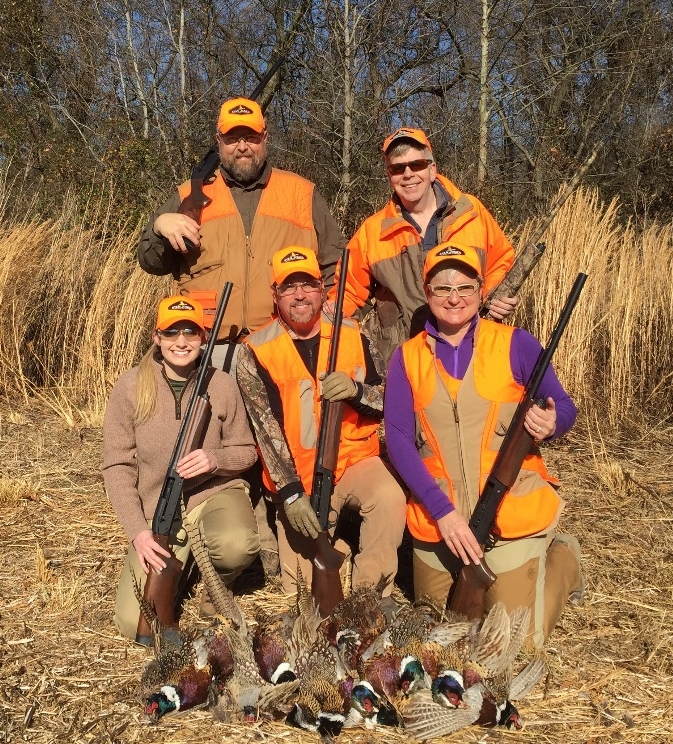 Our little group consisted of Rose Bier from the NRA / American Hunter, Michelle Cerino (Princess Gunslinger) from Women's Outdoor News, Remington engineer Vince Norton from Huntsville, and Remington ammunition specialist from Lonoke, Arkansas, Ronnie Evans, and myself. Michelle tends to scream when she shoots. So, if you happen to hear Michelle Cerino screaming it is usually in your best interest to take cover . . . quickly. The girls are no doubt still walking on a cloud after hunting with Ronnie Evans: he has that effect on people. Left to right: Randy, Michelle Cerino, Ronnie Evans, Rose Bier, Vince Norton, Hugo. 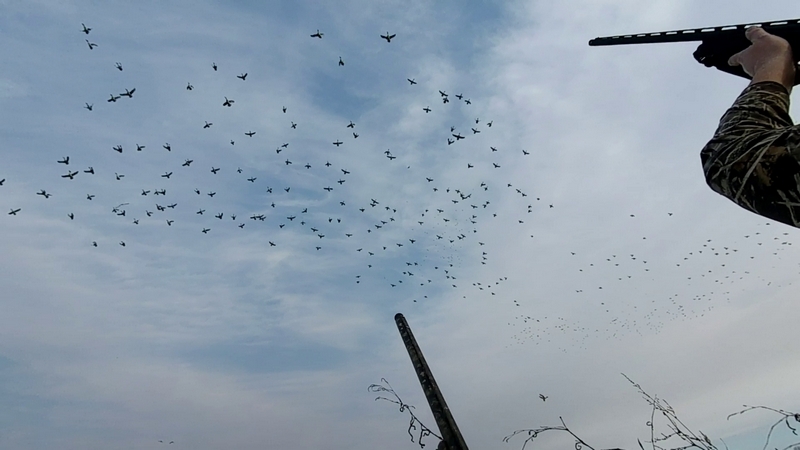 With clients flying in from across the country and around the world, Stan Jones has an ample array of everything needed or wanted for the hunts. As Stan's guns take beating, it was important for him to go with shotguns that don't break and need very little maintenance. Stan has standardized on the Remington Versa Max and the Remington V3, and as he told me several times, he is glad he did. Stan Jones has also standardized on ammunition: Remington HyperSonic steel loads is all we used on ducks, and everyone else at the lodge for that matter. They aren't the type of shell you want to use in a flyweight pump or even an inertia gun for that matter. Out of the Remington V3, recoil is no issue, nor is it any issue out of the Versa Max. Over the course of the hunts and including some sporting clays, there was not one single malfunction with the Remington V3 experienced by anyone. The best general purpose duck load, as far as I'm concerned, is the 1-1/4 oz. 1700 fps #3 shot HyperSonic shell. Compared to a more conventional 1400 – 1450 fps #2 steel 1-1/4 oz. load of about 155 pellets, by using 1-1/4 oz. of 1700 fps Remington HyperSonic #3 your pellet count jumps to about 191 pellets that have a similar performance envelope: that's 23% more pellets, 23% more pattern to work with. Extended choke tubes make a difference with this shell: I brought along a Trulock Precision Hunter Modified extended choke tube and that's all I used for everything. Ronnie Evans from Remington brought his own personal V3 to hunt with and he just happened to use a Trulock Precision Hunter modified choke tube out of his gun as well. This is not a coincidence. The first morning, we went out for pheasants, with the aid of Junior, the Jedi Master pointer, aided by Bonnie, apparently the Jedi apprentice. It was windy, to say the least. I filmed a video of the pheasant trek that you can view here: https://youtu.be/V1HDO1GXhwg . 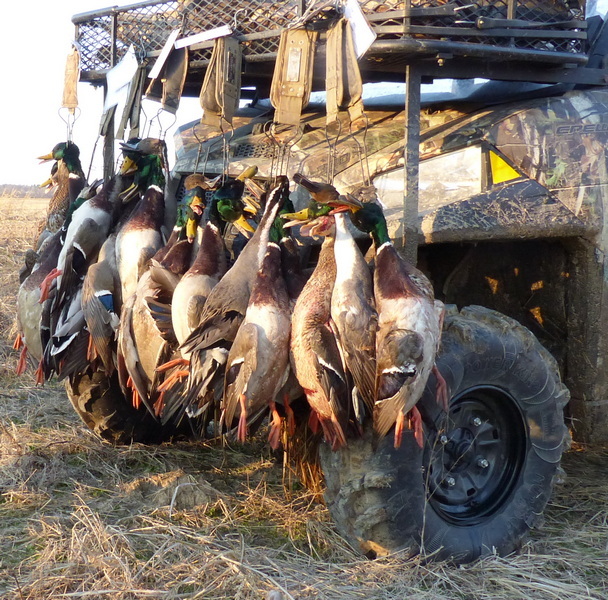 It is extremely dry in Arkansas, and the duck hunting that we did was from ground pits in the middle of flooded (irrigated) rice fields. With the help of head guide Jason Price and Tosh Manning (and talented black Labradors Hugo and Rio), the hunting was spectacular. We limited out in just a couple of hours. My video of our afternoon duck hunt is here: https://youtu.be/NyiNUJEbSMk . Everyone at the lodge will miss Rose Bier kissing animals that she really shouldn't be kissing and Michelle Cerino dancing and screaming whether for work or for play. Ronnie Evans and Vince Norton are both outstanding in their field. Last time I saw them, that's what they were doing: standing out in a field. I personally probably spent a bit too much time listening to a wine bottle talk to me about its criminal behavior. You could not possibly ask for a nicer group of people to hunt with, a nicer lodge, better guides, or better food: it was a terrific hunt all the way around. Everything was impressively well done: it was a world-class effort by Stan Jones and his team.